Chris here and today I am excited to share with floral greeting I created for Sin City Stamps. Stamp Chain Link from Sin City Stamps Barbed Wire Chain Link Stamp Set with grey ink onto white cardstock. Mat stamped image onto green cardstock. Stamps flowers from Sin City Stamps Flower and Bird Sketches onto white cardstock. 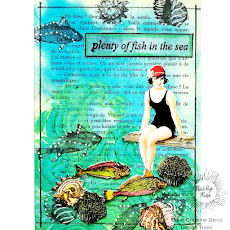 Color stamped images with watercolors as desired. Adhere stamped flowers onto chain link fence. Stamp greeting from Sin City Stamps Steampunk Circus and mat onto green cardstock. Adhere to card and add bird embellishment to finish card. Visit our Fan Page for more idea's!